Lisa Martensen and Jan Jones put together this little girl's room and in my opinion, it is one of the prettiest I've seen online! I looked through their portfolio several times and there was no shortage of beautiful interiors! This ISN'T YOUR TYPICAL girls bedroom...and perhaps that is what is so captivating to me. The use of blues & greens is always a great combo....what do you think?? For more of their work, visit their site here. So my question is: do you have any suggestions for boys' rooms? I would love to have some ideas because my son will be getting a new room soon. Yep, this room is lovely! Blue & green make a totally energizing space. Thanks, Jen! This is one of my all time favorites, lovely!! LOVE IT!!! my favorites colors, it's so fresh!! And the pillows... I want them!!!!! I hate to say it, but my little girls would have to fight mommy for this room! So refreshing...and the pillows are stunning! So perfect! Those white lanterns are so lovely. Just wanted to say that Im soooo happy that you're featured in Real Living Magazine! Its my absolute favourite mag and I buy it every month. Yay! i'd take that hermes throw myself! you're right, this room is lovely. i wouldn't mind it for myself! i love the pillows. beautiful!! i too like that it is not your typical little girls pink bedroom. 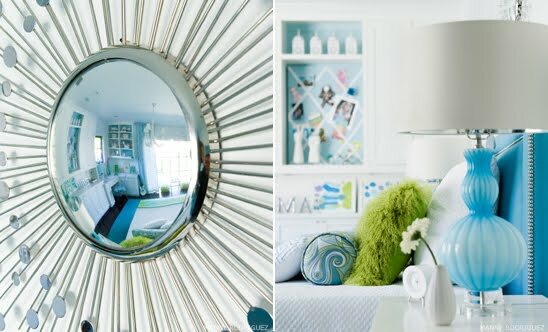 those shades of blue and green are very calming and i'm in love with the side table lamps. Just gorgeous! I love using blue in girls rooms. This is gorgeous! I would have loved to have this room when I was growing up... I'm pretty inspired to finish up my step-daughter's room now, thanks! I couldn't agree more! There are so nice colors for girls, their bedrooms didn't need to be just pink! Just loved the photos Jen, you as always finding the most beautiful spaces to share with us!!! Wow, will be saving this for my 10 year old who is begging me to redo her girlie green and pink little girl room (sniff). When I looked at the first pic..of only the bed and side tables, I thought, "This can be a bedroom for me". I too love the green and blue combo against a white contrast. Wow. What a beautiful room! That's one lucky girl and one talented designer. Love it! I LOVE that is ISN'T pink! Green and blue can be TOTALLY feminine and this is the proof! What a lucky little girl to have such a fabulous space! I love love love blue rooms for little girls. I think if I'm having a girl, I'll do the room in yellows and blues with pink accents...but not all pink. What a beautiful room! She can grow-up in that room & it won't look dated. I LOVE IT ... ME ENCANTA! Jen ... it has been so great to get to you, I think I will need a daily vist to your blgo, no question! I started my blog more than a year ago and I never thought it will be so fascinating! Oh my, I think this is the prettiest girl's room I've ever seen! I'll have to save this post and share. Love the Hermes blanket in the color theme. Wow. Ooh, I just did a post yesterday on blues and greens. I love this combo and how fun in a little girl's room! Not my favorite colors, but this is stunning! Very well done. I'm not a mother yet but I would love to have a baby girl and then make her a stylish, colorful and creative room like this, were she can play, dream and express joy. Any excuses are good for decorating just a bit more! ooooh I will show this to my seven year old who wants a literal interpretation of an "under the sea" bedroom! Absolutely Gorgeous! Fresh blue and green. I love the unexpected. I love little girl's rooms NOT done in PINK! So refreshing. What an easy room for a little girl to grow with into a big girl. Smart and sassy and brilliant! I love that it's not in the traditional colors. The blue and green are so fun and cool - what a lucky girl :)!! What a wonderful bedroom. Great color choices. It's happy and whimiscal, yet sophisticated. Lucky little girl. really cool room. i think it's important to create a space that children will grow into instead of feeling tied down to a certain theme. the color palette is perfection — i use some of the same colors on my blog! thank you for commenting by the way :) i think it's really cool when established bloggers like you take the time to comment on beginners' like mine! I luvs it!!! I would take it ANY day!! I love it cuz it works with all ages!! I've added a touch of grey though! Thank you Edyta! May issue.... finally! FRYD + DESIGN new online Magazine....!! !